I’m beginning to get a little insecure about my lack of winter flowers and garden structure. All I see is white and more white, and although I suppose a nice steady winter of cold and snow cover is far better than ice and repeated freeze-thaw, the strengthening sun is starting to make me antsy for growing things. Icicles harvested from the garden. A good crop of icicles is all I could find in the garden for Cathy’s vase on Monday meme. They’re from the garden, they’re in a vase, but I don’t think they’ll be gracing the dining room table. This entry was posted in cut flowers, winter and tagged icicles, in a vase on monday, winter. So much snow! thank goodness you have your indoor garden under the lights. 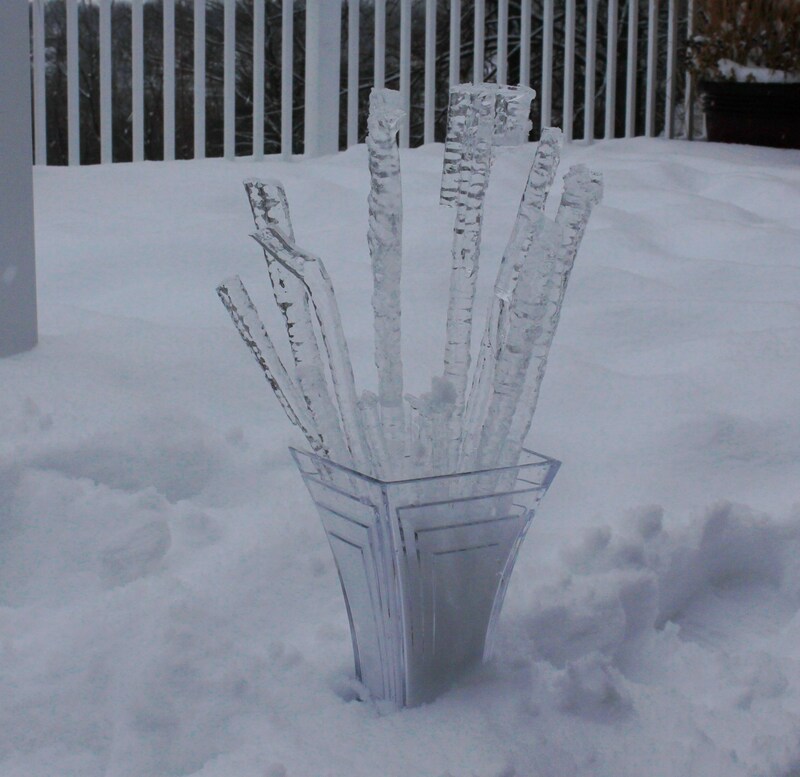 The icicles are a great idea for a vase, definitely thinking outside the box as Cathy says! Even the indoor garden is chilly today! Great idea for a vase! How wonderful! Now that was something I didn’t expect to see in the midst of all that snow. Snow clearly drives people to new heights of creativity. Thanks for the comment, but I still far prefer the colors and vases which you put together! I like it, what a good idea! Thanks, until the snowdrops come it’s the best I can do! I love it, You could set a trend there. After all, this meme is to use what we have in the garden for a vase. And that is exactly what you did. What fun. That is probably the most innovative, creative, imaginative, fabulous idea I’ve seen in quite some time. Wow!! Wow John, thanks! -and that is likely the most sincere, spirit boosting compliment I will get today! Thanks for the comment, ice and crystal seem made for each other, and the icicles are always perfect little sculptures in themselves! That is quite a crop of icicles. and I love the idea of this vase…so creative. I had to grow bulbs indoors so I could have flowers this winter….we are buried too up here in CNY. Heh. Is that what they call frost flowers? File this in the if-life-gives-you-lemons-make-lemonade department. Thanks Cathy, I’m glad people enjoyed it, and yes as I look ahead at the forecast they should last for at least the next week! You would definitely win the ‘Abstract’ section of a flower arranging competion with that – what a great idea and as Cathy says, possibly a long lasting one as well! Hopefully the spring is on its way for you so that at least the snowdrops will be visible. That’s funny because when I saw your post this morning and read the first paragraph my first thought was that you had the same idea. I guess you did! I love it! A conceptual vase! Next week you can fill a vase with slush! I hope so…. but as of now all the slush has turned to solid ice withour latest drop into the teens and single digits. Perfect! As some of my Facebook friends are fond of saying, you win the internet today, Frank! Awesome 🙂 I don’t think I’ve ever won the internet before! …. and I spent the afternoon sowing perennial seeds to put outside into the cold. Things are going well even with all the arctic-ness. I think the cold does promote creativity…. or madness! If you ever do find yourself missing a few icicles just let me know, and I’d be happy to send you all I have! Funny you should mention a vase of dead branches, I did look around to see if I could find a few with a nice coating of ice! Wow – hats off to you, as everyone else has said – a really creative vase. By the way – I’m insecure about my lack of flowers and I don’t even have any snow as an excuse! Brilliant. Laughed out loud and totally understand the lack of everything but snow.